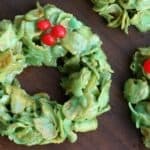 Christmas Cornflake Wreaths are one of my favorite easy Christmas treats that everyone in your family will love! 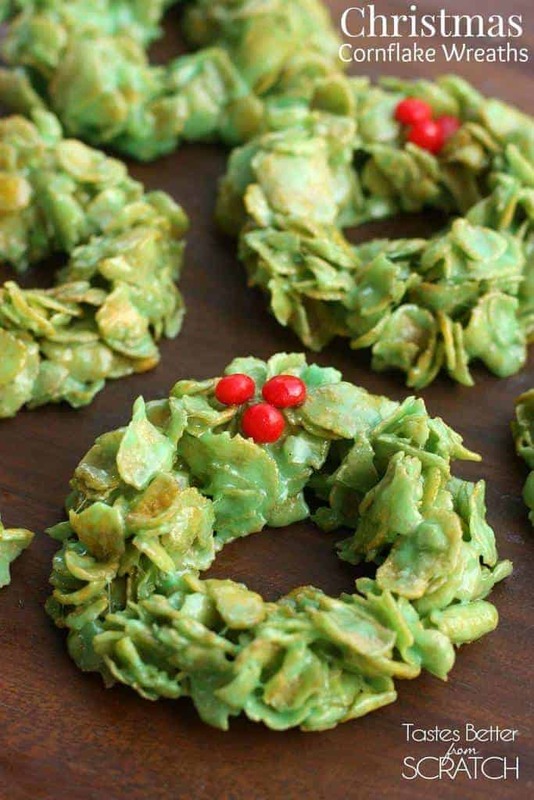 Ever since I can remember, my mom, sister and I have made these Christmas Cornflake Wreaths for the holidays. I have such fond memories of making these with the girls in my family! We’d line up, assembly line style. 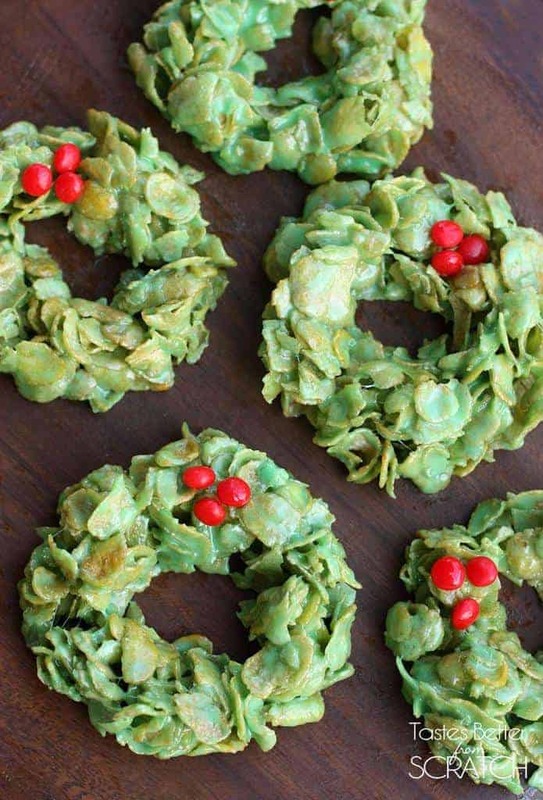 My mom would plop a spoonful onto parchment paper, I would shape it into a wreath, and my sister would add the red hots. Then we’d have to hide them before my brothers devoured them all! Measure corn flakes into a large bowl. Melt butter in a large saucepan over low heat. Once melted, add the marshmallows and stir continuously until completely melted. Stir in food coloring. Lay out a piece of parchment paper on your kitchen counter. Dollop spoonfuls of the cornflake mixture onto the parchment paper. Grease your (clean) hands with butter or cooking spray, or dip them in a little bit of water. Use your fingers to shape each spoonful into an individual wreath. Top each wreath with cinnamon candies. I add a teaspoon of almond extract. Really gives it great flavor! Hi, we have made these for birthday parties, but either colored nor formed. What color did you use? The one we bought did not really have an effect on the finish treats. I just made these and I had to adjust the recipe. Instead of low heat I used med low and that was a lot better. And I increased the marshmallows to 7 cups to cover all the cereal. Plus it takes more than 10 mins for them to set. But now their done. Also it’s time consuming to form them. My mom always made these every year & I make them most years. But her recipe uses 1t vanilla and the amounts of marshmallows & cornflakes are different, the butter is the same. Mine never form up thick the way yours look. Mine are thinner and spread out. I’ll be trying your proportions next Christmas to see if they form more nicely. I really like the flavor with vanilla. I once tried adding vanilla to rice crispy treats & it was overpowering, so it must just complement the cornflakes. My grandma’s (I’m 50+) handwritten recipe of this states to “mold the mixture around a buttered thimble”. We have always added almond extract….irresistible! YUM! I needed two entire bags of marshmallows to make the mixture coat the corn flakes enough so the wreaths don’t look naked. This is the first time I’ve made these. They set up pretty quickly and so my cinnamon candies didn’t want to stick. I also sprinkled some white non-pareils to look snowy. Next time I’ll get them onto the parchment paper sooner before they set up! I make just one big one. Tastes the same. Makes a nice impression.